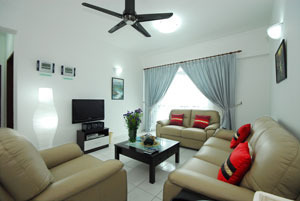 A Apartment is a well furnished, self contained apartment designed for temporary accommodation. A Apartment is well-equipped with all the basic and the modern amenities. Hotel rooms can be more expensive than service apartments. The main advantage of Apartments over a hotel room is that it makes oneself feel very homely and welcoming. Apartments are often called corporate houses or executive homes as it mainly aims at providing shelter to the people from the corporate world. Kuala Lumpur is the commercial center of Malaysia. Therefore, there are many people from the corporate world visiting the city for business or leisure. RentNow Apartment is the best solution and a perfect substitute for hotel rooms as it makes you feel extremely cozy and homely. RentNow is the only provider that has a complete range of 1 to 4 bedroom apartments for you to choose from. Since the beginning of the slump in international traveling prices and the corresponding increase in the sophistication level of the international travelers, interest in service apartment has significantly risen.